Russia has been largely landlocked for most of its history, and Moscow has always valued the Crimean peninsula for its coastline (see above). Catherine the Great took the Crimea, founding the port of Sevastopol, home to Russia's Black Sea fleet, and established a commercial port in Odessa. But, the 1991 collapse of the Soviet Union resulted in an independent Ukraine, and Moscow lost not only the port of Odessa but its prized naval port of Sevastopol. Russia's military intervention in Syria that began on September 30, 2015, is its first major intrusion into the Levant since June 1772 when "Russian forces bombarded, stormed, and captured Beirut, a fortress on the coast of Ottoman Syria." Then as now, the Russians backed a ruthless local client; then as now, they found themselves in "a boiling cauldron of factional-ethnic strife, which they tried to simplify with cannonades and gunpowder." But why? Why did President Vladimir Putin intervene in a faraway country, hundreds of miles away from Russia proper while in the midst of his temporarily frozen proxy war with Ukraine? So far there has been no serious effort to probe the underlying causes of the Kremlin's surprise move, let alone in conjunction with Putin's three other military interventions along Russia's periphery: Georgia in 2008, Crimea in 2014, and southeastern Ukraine in 2014-15. Yet it is only by filling in these connecting dots that the key questions concerning the intervention can be addressed: Did Moscow seek confrontation with a view to dismembering NATO and weakening Europe, or did it pursue the much narrower goals of regaining the great power status lost during the Gorbachev-Yeltsin eras and protecting national security and commercial interests? And can the West engage Russia in Syria in a limited partnership against radical Islam as it did in World War II against Nazi Germany, or is any collaboration with the wily Putin simply out of the question? special rhythm of its own over the centuries, expanding over land mass ... interrupted occasionally over time ... only to return again, like a tide crossing the beach. From Peter the Great to Vladimir Putin circumstances have changed, but the rhythm has remained extraordinarily consistent. The Russians will try all the rooms in the house, enter those that are not locked, and when they come to one that cannot be broken into, they will withdraw and invite you to dine genially that same evening. Both Kissinger's sophisticated discourse and Churchill's analogue, however, need an important qualifier. Russia's expansion has also been the result of a major geopolitical handicap. Except for the Baltic coast, conquered by Peter the Great in the eighteenth century, Russia has been largely landlocked for most of history. In the north, its Arctic Ocean was frozen. In the east, the Pacific was also ice-covered for most of the year. In the south, its Caspian Sea was closed. The Black Sea was open but only through those tiniest of bottlenecks, the Straits of Bosporus and the Dardanelles (or the Turkish Straits), jealously guarded by its Ottoman masters. Small wonder that Russia continually lusted to possess both them and the Crimean peninsula. As early as the seventeenth century, Peter the Great tried to conquer the Crimea, then an Ottoman vassal, but failed. Putin repeatedly invokes Russia's "strategic interests" in the Crimea. Only in the late eighteenth century did the Empress Catherine the Great and her paramour, Count Grigory Potemkin, succeed in taking the Crimea, founding the port of Sevastopol, home to Russia's Black Sea fleet, and a commercial port in Odessa. Yet despite continual wars with the Ottomans, the Turkish Straits remained beyond Russia's grasp as Britain—and to a lesser extent France and the Kingdom of Sardinia (Italy)—repeatedly came to Turkey's rescue. This culminated in the 1853-56 Crimean war and the attendant Treaty of Paris that kept Russia caged in the Black Sea. It is hardly to be surprised that Putin, an avid student of history, repeatedly invokes Russia's "strategic interests" in the Crimea. Today, Russia is not as militarily dependent on the Turkish Straits as in the past. But throughout the twentieth century to the present day, and despite the technological revolution and Moscow's formidable air forces, the Turkish Straits have remained a factor for the Russian navy. The 1991 collapse of the Soviet Union was an even larger setback than the Crimean war. Analysts have long focused on the loss to the empire of vast pieces of real estate with the newly-won freedom of the non-Russian republics in the Baltics and the Caucasus as well as the second largest republic, Ukraine. Yet they have not given due consideration to what else Russia lost: waterways, coastlines, and ports, in short—the power of the Russian navy. Hafez Assad, Bashar's father, signed an agreement permitting Moscow to use the port of Tartus (pictured above) in return for advanced weapons for Syria, thus turning the port into a facility for maintenance of smaller ships in the Black Sea fleet. Then in 2005, Bashar succeeded in having Russia write off three-fourths of Syria's debt for arms sales. Increased Russia-Syrian military cooperation followed with upgrading of the Tartus port for larger ships. In Estonia, Latvia, and Lithuania, Moscow lost cold water ports acquired by Peter the Great in the eighteenth century for its Baltic fleet. In Ukraine, it lost not only its ownership of the coastline but also the commercial port of Odessa. Most of all, the Russians lost their prized warm water naval port of Sevastopol, home to Russia's Black Sea fleet for more than two centuries. Moscow was now forced to rent it from the newly independent Ukraine. The economic collapse that followed only made things worse. Lack of resources and two bloody wars in Chechnya brought government cuts to the Black Sea fleet. Russian ships only rarely appeared in the Mediterranean. Then in 2004, Ukraine and Georgia underwent their color revolutions, bringing to their helms two pro-Western leaders—Viktor Yushchenko in Ukraine and Mikheil Saakashvili in Georgia—who hoped that their nascent states would join, not only the European Union, but eventually the North Atlantic Treaty Organization (NATO). Worse yet for Russia, Yushchenko wanted the Russian fleet out of Sevastopol at the expiration of the lease in 2017. Catherine the Great, Putin's most admired Romanov ruler, was shaking in her grave. One need not speculate about Putin. In 2005, who could be sure that NATO ships would not be eventually deployed in Russia's formerly principal, if not sacred, Black Sea port? If Russia lost Sevastopol, where could it go? Another port was needed, but where? Novorossiysk on the Black Sea Coast could be of help, but it is principally a commercial port. Flashback to 1971, when President Hafez Assad, father of the present Syrian dictator, signed an agreement permitting Moscow to use Tartus in return for selling advanced weapons to Syria, thus turning the quiet fishing port into a logistical facility for materiel and technical maintenance of smaller ships in Russia's Black Sea fleet. Two years later, Hafez, a Soviet-trained pilot, joined Egypt in preparing an attack on U.S. ally Israel with the help of Russian advisors and arms. This [Sadat's demand for Soviet advisors withdrawal] began a turmoil. Egypt's premier Sidki was persuaded to come to Moscow, and, I think, they have settled it ... they must have given much to him, if not all he wanted. President of Syria Assad, too, a week ago ... has forced us to practically approve the "military solution" and received a lot from us. The various government agencies spread rumors and stories that were exaggerated, to say the least, about deficiencies, both quantitative and qualitative, regarding the weapons required to begin the battle against Israel, at the very time that ... the two parties—Egypt and the USSR—had reached agreement [on weapons that] in fact, were beginning to arrive. The concept of military deception is a permanent feature of Russian interventionism. Last but not least, Egyptian president Sadat himself claimed two years after the war that his 1972-73 tiff with the Soviets had been "a strategic cover—a splendid strategic distraction for our going to war." The concept of military deception, or maskirovka, is a permanent feature of Russian interventionism. But, it encompasses a broader definition than the Western one. Deception may include camouflage, disinformation, traps, blackmail, and diplomatic cunning. As such it enables strategic surprise and/or timing that will stun the enemy, thus ensuring the success of the mission. Along both its pre- and post-1991 borders, Russia has continually sought to effect regime change whenever the leaders of the non-Russian republics within Russia (e.g. Chechnya) or at its new periphery (Ukraine and Georgia) tilted toward the West. In 2005, having decisively won the second Chechen war with the complete destruction of its capital Grozny, Putin was able to focus on possible regime change in Tbilisi (Saakashvili) and Kiev (Yushchenko). 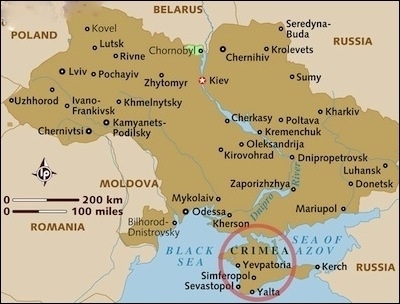 Unlike with landlocked Chechnya, both Ukraine and Georgia were littoral states of the Black Sea. A main geopolitical concern of the Kremlin was regaining ports and access for its navy. 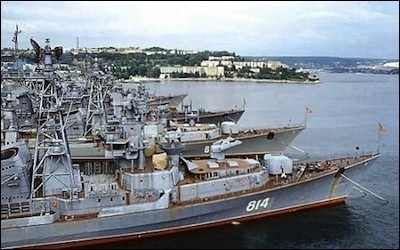 But the primary issue was Sevastopol—the traditional site of the Black Sea fleet. Getting rid of Ukraine's Yushchenko and Georgia's Saakashvili, thus meant regaining essential coastlines for the Russian navy. Its lease was up in 2017, and Moscow needed to find another suitable warm water port. Russia has sought to effect regime change whenever the leaders of the non-Russian republics within Russia tilted toward the West. Hafez Assad's successor, son Bashar, was quick to seize the opportunity. He visited Moscow in 2005 and succeeded in having three-fourths of Syria's external debt to Russia for arms sales written off. The move became an impetus for renewed Russian-Syrian military cooperation in upgrading the port of Tartus for larger ships. At around the same time, Putin began to seriously consider plans for the invasion of Georgia with particular interest in the province of Abkhazia, occupying half of Georgia's eastern Black Sea coastline. Analysts have mistakenly viewed Georgia as just another Caucasus country, but from the Russian navy's point of view, it is precious real estate on the Black Sea littoral. Georgia not only contained a former Russian port, Ochampchire, but an airbase, Bombura—once the largest in the Caucasus. As an ethnic enclave with Orthodox believers and many Russian speakers, the Abkhazians had not been thrilled when Georgia obtained independence, correctly fearing the loss of their special status as an autonomous republic. Like South Ossetia, another ethnic enclave in the Caucasus Mountains, Abkhazians were in repeated conflict with Georgia and sought support from Russia. Furious residents had even undertaken ethnic cleansing of Georgians. All of this fitted snugly with Putin's plans. In 2006, the Russian army began building a railroad in Abkhazia, traditional transportation for Russian armed forces. As the Russian consulate began to distribute passports, Putin added additional "peace-keeping" troops to Abkhazia, alleging a Georgian planned attack. On August 7, 2008, President George W. Bush met Putin at the Olympic Games in Beijing where he was told about the fighting in South Ossetia: "There are lots of volunteers being gathered in the region [South Ossetia], and it's very hard to withhold them from taking part. A real war is going on." What Putin did not tell his peer, however, was that he had set a trap for the Georgian army in South Ossetia, that the Russian navy would soon invade Abkhazia, and that he had ordered a cyber-attack on the Georgian government. Within twenty-four hours, Putin had already appeared in Vladikavkaz, North Ossetia's fortress, to oversee the invasion. When the Georgian army arrived to put down (supposed) riots in the South Ossetian capital, the Russian army poured through a tunnel on the Georgian military highway into South Ossetia and beyond. A classic trap was sprung. Simultaneously came the amphibious landing in Abkhazia's port of Ochampchire by 4,000 navy and army commandos under commander-in-chief of the Black Sea fleet, Adm. Vladimir Vysotsky. On August 10, a naval encounter between Georgian and Russian ships took place, and within days, Georgia's entire fleet of coast guard patrol vessels had been destroyed. The Russian navy was back. Ochampchire, once restored, would provide control of Georgian waters all the way to the Turkish border. On September 12, 2008, a month after Abkhazia's conquest, the Kremlin announced the speeding up of the Tartus port renovation and expansion as Vysotsky met with his Syrian counterpart Gen. Taleb Bari, to set the process in motion. In 2009, the value of Russian military contracts reached $19.4 billion as floating docks and coastal infrastructure facilities were repaired in Tartus. Eventually, the Russian navy deployed mobile coastal missile systems, anti-ship missiles, and boats, and built warehouse barracks. As an unnamed Kremlin official remarked in the Russian media, "Everything has changed since the war on Georgia—what seemed impossible before when our friends became our enemies and our enemies became our friends ... A number of possibilities are being considered, including hitting America where it hurts most—Iran and Syria." "The Crimea is next," predicted Za Za Gachechiladze, the prominent editor-in-chief of Tbilisi's The Messenger. In an editorial, he wrote, "Now it is the Ukraine's turn ... all this is happening while Western countries are hesitating about creating a clear-cut strategy to stop Russia, whose appetite ... is increasing." Georgia had indeed marked a change in the Kremlin's strategic thinking, and Putin would strike in Crimea when the time was ripe. Nor did he believe that Washington would greatly protest. The U.S. administration was clearly willing to forgive him for attacking sovereign Georgia. Earlier that year, U.S. secretary of state Hillary Clinton had pushed a big red reset button with Russian foreign minister Sergei Lavrov, and Russian decision-making on a new intervention always considers the U.S. response to the last one. Also overlooked was the Russian legislature's amending of the constitution. This permitted Putin to take military action abroad anywhere to protect Russian speakers and Russian military (e.g., in Crimea or Syria). During the Yeltsin era, they could only do so to combat terrorism or participate in U.N.-sponsored international operations. Now the government could take military action against any foreign country without authorization from the Duma. But the time was not yet ripe to strike in the Crimea. In 2010, came a new Ukraine election, and the winner was Viktor Yanukovych. Coming from the eastern Ukraine, he was staunchly pro-Kremlin, so Putin could relax. In return for discounted Russian gas, Yanukovych gladly extended the lease on Sevastopol to 2046. The peculiarity of the port of Tartus ... is that the major Syrian pipeline originating from the northeastern areas of the country feeds in this port. Besides, oil storage facilities are located in neighboring Banias. Syria is not just a transfer state but also has large gas deposits in its Homs field. Bashar Assad decides whose pipelines go through Syria, another reason Putin supports him. Seventy percent of Russia's foreign income comes from oil and gas exports. Sixty percent of the state budget is from energy export revenues. As a vacationing official economist in Sochi told these authors, "Don't follow just our navy; follow our pipelines." The pipelines, of course, passed through energy transfer states Georgia, Azerbaijan, and Ukraine on their way to European markets—all states no longer under Putin's control. Bashar Assad decides which and whose pipelines go through Syria, another reason Putin supports him. In 2009, the Syrian president refused to sign a gas agreement with Qatar—a major producer of liquefied gas (LNG)—which wanted to run a pipeline from Iran through Turkey and Syria. But the deal would have bypassed Russia, and Assad turned it down. A number of events conditioned Russia's decision to deter a U.S. attack on Assad in 2013 and also to stage a military operation in Syria in 2015. One of these was the lesson of Libya. In 2011, Washington persuaded Moscow not to veto a Security Council resolution against Libyan dictator Mu'ammar al-Qaddafi, which launched what Secretary of State Clinton described as a "humanitarian mission" to prevent the killing of Libyan civilians by the dictator's forces. But as NATO intensified its bombing air campaign, it became clear that the international intervention was mainly focused on getting rid of Qaddafi with a view to nation building—something that had miserably failed in Iraq under the George W. Bush administration. The 2003 Iraq war, though, had a positive side. Reluctant to follow in Saddam Hussein's unfortunate path, Qaddafi abandoned his quest for a nuclear program and began working with Washington against the rising tide of Islamist terrorism. Paradoxically, the Western-supported rebels who toppled and killed the long-reigning Libyan dictator included many Islamists. To Putin, however, Qaddafi had clearly been a stabilizing force. Putin may have also learned from Hillary Clinton's unsecured e-mail communications that U.S. ambassador Chris Stevens had met with the Turkish consul general hours before he was killed. The two were working on an arms transfer from Libya to Syria—for the purpose of overthrowing yet another dictator, Assad. The lesson of Libya for the Russians was that they should not have approved the U.N. resolution that helped the U.S.-backed NATO intervention. Convinced that they had been deliberately misled, they would subsequently block any future U.N. resolution proposing military action against Assad. Then-president Dmitri Medvedev expressed his concern about the rise of Islamic terrorism in Libya to U.S. officials. But the situation in Libya attending Qaddafi's overthrow was worrisome to the Kremlin for other reasons. In 2011, then-president Dmitri Medvedev expressed to U.S. defense secretary Robert Gates and vice president Joe Biden his great concern about the rise of Islamic terrorism in Libya. "If Libya breaks up, and al-Qaida takes root there, no one will benefit, including us, because the extremists will end up in the North Caucasus." Medvedev could have added that extremists from the North Caucasus were also traveling to Syria with the help of Russia's Federal Security Service (FSB). Novaia Gazeta journalist Elena Milashina documented that the FSB had helped Chechen and Dagestan rebels to reach Syria on safe routes via Turkey. Indeed, the number of terrorist attacks in the North Caucasus was halved from 2014 to 2015, from 525 to an estimated 260. Russian special services, however, were and still are worried about returning jihadists. In August 2013, the Syrian regime was reported to have used chemical weapons on rebel enclaves, killing some 1,300 civilians. Assad appeared to have crossed President Obama's "red line" on use of such weapons. Washington deployed four destroyers near the Syrian coast equipped with missiles, threatening the Syrian regime. But Putin helped to defuse the crisis by brokering a deal for Assad to get rid of his chemical weapons. Another event conditioning Putin's decision-making regarding further interventions was a major crisis over Assad's reported use of chemical weapons. On August 21, 2013, the Syrian regime was reported to have used chemical warfare on rebel enclaves, killing some 1,300 civilians. With this atrocity, Assad appeared to have crossed President Obama's "red line" on chemical weapons and risked a strong U.S. response. Putin and even some U.S allies, however, claimed that the attacks were carried out by anti-Assad guerillas as a "premeditated provocation." 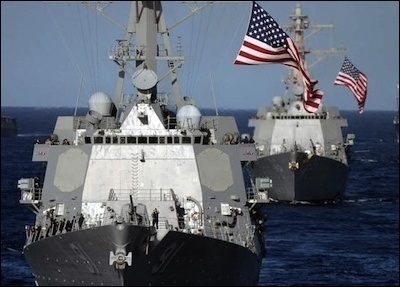 In any event, on August 27, Washington deployed four destroyers near the Syrian coast equipped with Tomahawk Cruise missiles whose initial mission was to punish the Syrian regime. Unfortunately, the force we've assembled there is made up of pretty aged ships built 30 years ago. To compete with the United States, we need a fresh horse. Putin, however, also wagered that Obama would not opt for a direct confrontation with Russia. Thus, sailing to the fray were some aged Russian navy ships. But equipped with modern rocket systems and nuclear torpedoes, even an old ship can be formidable. Russia also mobilized its armed forces, as did Iran's Revolutionary Guards, while Moscow's foreign ministry warned that U.S. intervention in Syria could have "catastrophic consequences." One Russian analyst suggested that in the event of a U.S. attack on Syria, Russia should invade the Baltic states. On August 27, as Obama met with the three leaders of the Baltic republics, Putin had one of his senior analysts, Mikhail Aleksandrov, publish an especially provocative article, which could not have appeared without Kremlin approval. Head of the Baltics section of the Moscow Institute, CIS, funded by the Russian ministry of foreign affairs, Aleksandrov suggested that in the event of a U.S. attack on Syria, Russia should invade the Baltic states, claiming that "half of the population of Latvia and Estonia will meet the Russian troops with flowers as it was in 1940." Putin's deterrence, pressures, and public diplomacy—he even went so far as to write a New York Times op-ed—must have ultimately worked. Obama backed down, as Putin foresaw. The Russian president then helped his counterpart to defuse the crisis by brokering a deal to help Assad get rid of his chemical weapons. Having rescued his Syrian client, Putin now sought to save his Ukrainian protégé Yanukovych, who had narrowly won the 2010 elections with the Kremlin's support. While a kleptocratic leader could be tolerated in moderation, Yanukovych, who had been jailed twice for corruption in 2004, was a major leaguer. Eventually, the Ukrainian people could not tolerate his disregard of their inclination toward the European Union. In January 2014, someone fired into a large crowd of peaceful protestors igniting an armed revolution. A further turning point came on February 22 as the Ukrainian parliament voted to remove Yanukovych. But what few in the West understood was that the future of Sevastopol was not secure if the pro-Western revolution in Kiev won. Having saved Yanukovych's life, Putin turned to the strategic Crimean peninsula telling his presidential council, "We will have to start work to return the Crimea to Russia." As in Abkhazia and South Ossetia, most Crimeans are Russian speakers with 60 percent ethnically Russian. Yet the peninsula's large Tartar minority of about 30 percent have never cared for Russian rule, hence their mass deportation by Stalin to Central Asia in WWII. The Ukrainian army was rag-tag, but Putin feared that the Muslim Tartars might resist the Crimea's annexation as they had Catherine's in 1784. Once again, Putin's attendance at the winter Olympic Games in Sochi turned into perfect maskirovka. Despite large scale, nonstop Russian troop maneuvers near the Crimea, U.S. intelligence failed to anticipate the February 28, 2014 invasion. Once the Olympics ended, the invasion began, followed in short order by annexation. it gives us every reason to state that for Russia, the Crimea, ancient Korsun, the Chersonese, Sevastopol have an enormous civilizational and sacral meaning—in the same way as the Temple Mount in Jerusalem is meaningful for those who confess Islam or Judaism. Whether or not Putin's evolution from a servant of atheistic communism to defender of the faith is genuine is irrelevant. After the fall of the Soviet empire, Russia returned to its Orthodox roots, and so did Putin. Hence, while authorizing a selective crackdown on human rights activists throughout Russia, Putin has been an ardent supporter of the Orthodox Church at home and of Christian minorities in Syria, Egypt, and Iraq. He also met with the pope on June 10, 2015, who asked him to help the cause of peace in Ukraine and Syria. On April 18, 2014, by way of consolidating his Crimean conquest, Putin set his sights on yet another target. He explained that the southeastern Ukrainian lands of Novorossiya ("New Russia"), also conquered by Catherine the Great, were not part of Ukraine in her time. However, Putin did not admit that his primary reason was geopolitical—a littoral corridor from Russia to the Crimea through the strategic Black Sea port of Mariupol to Odessa. Emboldened by the passive Western response to his Crimean venture, Putin launched a new intervention by proxy through Russian eastern separatists, "volunteers," Cossacks, "vacationing soldiers," even paid criminals, as well as Russian special forces. Residents of the Russia-friendly southeastern Ukraine were propagandized into fury against Kiev. Seeking to rejoin Russia, as did the Crimeans, they declared two new people's republics: Donetsk and Lugansk. Weeks thereafter, violence erupted in Odessa. A firm U.S. response was required, yet the Obama administration would not provide arms to Kiev because of its perceived need to have Russia's support for the Iran nuclear deal. This weak reaction, however, only added to Moscow's eventual commitment of 10,000 regular troops in the Ukraine, augmented by 40,000 at the borders. But then came Putin's miscalculation. The Ukrainian army vigorously defended important routes, strategic railroad hubs, and airports, denying Russia essential strategic surprise. With the support of Western intelligence and economic aid, this solid resistance paid a high cost in blood, but Kiev did not succumb. In July 2014, Washington finally applied tougher energy sanctions which, together with sharp declines in oil prices, halved Russia's oil and gas revenues. In the summer of 2015, Assad, like Yanukovich earlier, was fighting for his survival. Various groups of rebels, supported by the Sunni regimes of Turkey and Saudi Arabia as well as the United States, were advancing. Assad and his Alawite-based regime were on the ropes with the military losing ground by the day. In July, the regime asked for Russia's direct military intervention. Using Brezhnev's 1973 Yom Kippur play book and his own Georgia and Ukraine maskirovka, Putin was giving different signals—even that of replacing Assad. Whatever Putin intended, he decided to stick with the Syrian dictator at this juncture. Though U.S. observers questioned Putin's motives, his secondary objective in Syria was fighting the Islamic State of Iraq and Syria (ISIS). While terrorist attacks in the North Caucasus had declined in 2015, ISIS was metastasizing in northern Afghanistan and could, over the long run, affect Russia's Central Asian allies. Putin surely worried about North Caucasians returning to fight in Russia. By early 2015, the term "New Russia" had virtually vanished from Putin's vocabulary. He viewed the growing, armed resistance to the Assad regime as an immediate threat to Russia's national interests. Traditionally Moscow does not fight simultaneously on two fronts. In the meantime, a Russian Defense Ministry official, who spoke on condition of anonymity, said that, beginning in September or earlier, the "special forces were pulled out of Ukraine and sent to Syria." 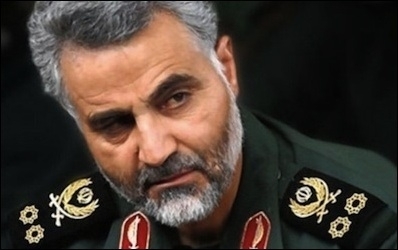 Assam Soleimani, head of Iran's Revolutionary Guards, is much respected in Moscow for his military prowess. Arriving secretly in the Russian capital, the general confirmed that the Assad regime was in serious difficulties but could be rescued through a joint Russian-Iranian-Hezbollah intervention. Putin must have calculated that if Syria could be won and Western sanctions lifted without significant concessions, it would strengthen the eventual return to his New Russia policy and Black Sea littoral corridor, unless, of course, Washington linked resolution of both the Syrian and Ukraine conflicts. He reportedly told a visiting Iranian senior official in late July 2015, "Okay, we will intervene. Send Assam Soleimani." Gen. Soleimani, head of Iran's Islamic Revolutionary Guard Corps, is much respected in Moscow for his military prowess. Arriving secretly in the Russian capital, the general confirmed that the Assad regime was in serious difficulties but could be rescued through a joint Russian-Iranian-Hezbollah intervention. Iran is an important strategic ally for Russia. Like Syria, it has been buying Russian weapons systems, engaging in cooperative pipeline projects, and buying nuclear power plants. The conclusion of the U.S.-Iran nuclear deal on July 14, 2015, in Vienna was also a game-changer. Putin, having helped Obama broker the deal, had waited to make any Syria decision until the agreement was concluded. Now, with the deal done and Iran sanctions soon to be lifted, Tehran could readily pay for Russia's long-range S-300 anti-aircraft system. Putin also hoped that, now, Iran-U.S. relations would improve, making it easier for Russia to work with Iran and Hezbollah to protect Assad. 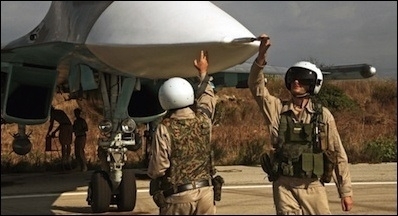 Airmen inspect a Russian airplane at Syria's Latakia airfield. In September 2015, U.S. satellite pictures showed a rapid buildup of equipment at the Russian air force and naval bases in Syria, including advanced fighter jets. On November 24, 2015, a Russian fighter was downed by Turkish forces after allegedly violating Turkish air space. The plane crashed in the mountainous Jabal Turkmen area of the Syrian province of Latakia, an area contested by Assad's government and rebel forces. Mulling his options, in September Putin invited his old friend, former Italian prime minister Silvio Berlusconi, to the annexed Crimea to discuss Ukraine and Syria. Prior to the visit, Italian news sources revealed that Berlusconi planned "to include Putin in an anti-terrorist campaign, promoting a diplomatic initiative that could lift the anti-Russian sanctions and defrost relations with the U.S."
We have to speak with many actors, this includes Assad, but others as well. Not only with the United States of America, Russia, but with important regional partners, Iran, and Sunni countries such as Saudi Arabia. Like the CIA, Germany's intelligence agency knew about the military buildup in Tartus and Syria's Latakia airfield. However, the CIA could not divine Putin's intentions. Merkel's remarkable turnaround did not get much notice in Washington with Obama focusing on Iran and Cuba. But getting Merkel's blessing was the final green light for Putin. The U.S. president was heading for a big surprise. In the concluding phases of the 1973 Yom Kippur War, the Egyptian third army corps was surrounded by Israeli forces and faced imminent annihilation unless an immediate ceasefire was reached. Soviet leaders, with their proposed joint superpower mission to save Egypt having been declined, sent a strongly-worded message to the White House warning that they would act alone. As a result, U.S. armed forces were put on combat alert as they had been during the 1962 Cuban missile crisis. In spite of the blunt message of [Soviet leader Leonid] Brezhnev, the Kremlin ... did not have any intention of intervening in the Middle East ... it would have been reckless both politically and militarily. In 2015, however, the man in the White House was not Richard Nixon, an experienced master of statecraft, brilliant, tough, and cunning, with his sidekick Henry Kissinger, even amidst his Watergate inferno. This time Putin's counterpart was a former community organizer-turned-junior senator-turned president, a well-meaning proponent of the "leading from behind" strategy, a man whose "strategic patience" to his critics, was a euphemism for cluelessness. For most of September 2015, U.S satellite pictures showed a rapid buildup of equipment in the Russian air force and naval bases in Syria, including advanced Sukhoi Flanker fighter jets. Now the renovation of Tartus paid off as had the railroad built in Abkhazia. On September 21, Putin consulted with Tehran's nemesis, Israeli prime minister Binyamin Netanyahu in the Kremlin, along with top Israeli military and security officials. Afterward, the Israeli leader reported that both countries had agreed to a joint mechanism for preventing military mishaps. Putin's battle against terrorism may be one of the reasons he sympathizes with and has established mutually beneficial relations with Israel. Putin is the only Russian leader to have twice visited the holy city of Jerusalem. His own merciless battle against terrorism may be one of the reasons he sympathizes with the Jews and has established mutually beneficial relations with Israel. Small wonder that Israel abstained from arms deliveries to Georgia after the 2008 Russian invasion and to Ukraine after the Crimea incursion. In August 2008, Putin had met with President Bush on the eve of the Georgia invasion. Seven years later, on September 28, 2015, it was Obama's turn to meet with the Russian president, this time at the U.N. Although the full details of their conversation were not disclosed, Putin apparently did not reveal the timing of the coming intervention. His contemptuous message to Obama, delivered to the U.S. embassy in Baghdad on August 29 by a Russian military attaché, said it all: Moscow was launching air strikes in one hour. Washington was to stay out of the way. Putin did not charge into Syria without thinking through the endgame. The intervention was the culmination of a chain of events that began with the 1991 fall of the Soviet empire, and Putin concentrated on only a few options. His aim seemed clear: reestablishing Russia's presence in the Black Sea and through the Turkish Straits to the eastern coast of the Mediterranean and Middle East in littoral Russian Azov and Black Sea coastal areas. Unlike his Soviet predecessors, he has avoided large invasions and long occupations of landlocked countries (e.g., Hungary, Czechoslovakia, Afghanistan). The perception of Obama as a leader unwilling to use force undoubtedly whetted Putin's appetite to do just that, albeit in a limited way. In particular, the 2013 Russian deterrence of Obama's strike against Assad may have emboldened Putin to stage the almost flawless (and bloodless) 2014 Crimean invasion. That in turn likely strengthened his resolve for his unprecedented moves in eastern Ukraine and now in Syria. Rather than seeking to dismember NATO, Russia sought to protect its national security and commercial and religious interests. The weakening of NATO became Putin's objective as he lost Kiev and finally faced tough Western energy sanctions and as NATO furnished non-lethal aid to Kiev. A limited partnership with Russia against Islamism is feasible just as it was in World War II against the Nazis. Both Washington and Moscow have powerful incentives and common interests in stability as ISIS continues to metastasize globally. A limited partnership with Russia against Islamism is feasible just as it was in World War II against the Nazis. Achieving this goal, however, requires shedding the Cold War axiom that Russia cannot have naval facilities in the Middle East. Instead, Washington must do its utmost to reassert its own presence in the Middle East in collaboration with those allies alienated by the Obama administration. Clearly, any alliance with Russia will not be easy, and the West must not be starry-eyed about a new relationship with Putin and in a hurry to reduce Ukrainian sanctions in the wake of the Muslim invasion of Europe. Putin is notoriously deceptive, giving with one hand and taking with the other. He is also allied with Tehran, whose hegemonic ambitions and terror sponsorship are certain to rise following the lifting of the international sanctions. Yet U.S. policymakers can surely make the case that, in the final account, Moscow's long-term interest is more closely aligned to Washington's and America's Judeo-Christian tradition than to the Islamist regime in Tehran with its regional, and beyond, hegemonic ambitions. Putin is right to support the sustenance of Alawite governing structures, particularly in the western part of Syria, as the only viable alternative to the country's takeover by the Islamists. But keeping Assad in power will not ease the situation. Bashar must clearly step down in favor of another Alawite ruler and any such future agreement has to be underwritten by the U.S. administration, the EU, Russia, and the leading Arab states. The nascent partnership with Russia can be jeopardized by further internationalization of the Syrian conflict. One problem is Sunni support for the insurgents, such as the Turkish tribes in northern Syria. Another is Iran's proxy Hezbollah, which is heavily involved in the fighting. Moreover, increasing military aid to various parties can escalate the conflict and implicate other actors. Recent Russian transfers of sophisticated weapons to Hezbollah are the most palpable examples. Though intended for defense of the Assad regime, they can also be used against Israel at a later stage. Ankara has many ways to make life harder for Moscow, ranging from changing its energy import preferences to the Gulf to utilizing its influence over the numerous communities of Crimean Tatar descendants in Turkey in ways detrimental to Russia's interests. Meanwhile Turkey, an unreliable U.S. ally at best, is more interested in containing the Kurds, faithful U.S. allies, both in Syria and Iraq, than in going after ISIS. In short, the Syrian situation is evocative of the Spanish civil war of the 1930s when the internationalization of a domestic conflict helped pave the road to a global war. As the past is often prologue to the future, it remains to be seen whether Putin's bold Syrian venture will help to transform the Middle East inferno into a more peaceful region. One decisive factor is the dramatic decline of oil prices, very injurious to Russia. A second factor will be the statecraft of the new U.S. president, ideally, one who does not lead from behind and who possesses the proper alchemy of toughness, creativity, and patience to help accomplish the deed. Jiri Valenta is president of the Institute of Post-Communist Studies and Terrorism, and the author, among other books, of Soviet Intervention in Czechoslovakia, 1968, Anatomy of a Decision (Johns Hopkins University, 1991). He is a member of the Council on Foreign Relations. Leni Friedman Valenta is a contributor to many national and international newspapers and magazines, including The National Interest, Aspen Review, and Kiev Post. She is editor-in-chief of the couple's website at jvlv.net. Simon Sebag Montefiore, "Putin's Imperial Adventure in Syria," The New York Times, Oct. 9, 2015. Henry Kissinger, World Order (New York: Penguin Publishing Group, 2015), p. 52. Walter Issacson and Evan Thomas, The Wise Men (New York: Simon and Schuster, 1997), p. 364. For a similar geopolitical interpretation, see Efraim Karsh, The Tail Wags the Dog: International Politics and the Middle East (London and New York: Bloomsbury, 2015), chap. 5. See, for example, Efraim Karsh, "Moscow and the Yom Kippur War: A Reappraisal," Soviet‑Jewish Affairs, Feb. 1986, pp. 3‑19. Spyridon Mitsotakis, "Forty Years Later: Soviet/Arab Secret of Yom Kippur War," P.J. Media, Oct. 5, 2013. Michele A. Berdy, "Russia's 'Maskirovka' Keeps Us Guessing," The Moscow Times, July 31, 2-14; Jiri Valenta, "Soviet Use of Surprise and Deception," Survival (London), 1982, pp. 50-61. The Daily Star (Beirut), Jan. 26, 2005. Wired (San Francisco), Aug. 15, 2008; Deborah Sanders, Maritime Power in the Black Sea (Burlington, Vt.: Ashgate Publishing Co., 2014), p. 126. "Russia lines up with Syria, Iran against America and the West," Second Light Forums, Sept. 16, 2008. Interview with authors, Sept. 19, 2009, Tbilsi. Za Za Gachechiladze, "Russia Will Increase Its Pressure on Ukraine," The Messenger (Tbilisi), Sept. 18, 2009. "Legalizing Aggression," Geopolitics, quoted in The Messenger, Sept. 11, 2009. Alexei Sarabeyev, "Russia-Syrian, 'Present-Future': Naval Aspect," Russian International Affairs Council, Moscow, Oct. 31, 2011. Authors interview, Sochi, Russia, Aug. 14, 2010. Robert Gates, Duty: Memoirs of a Secretary at War (New York: Alfred Knopf, 2014), p. 530. Fox News, Oct. 25, 2012. Novaya Gazeta (Moscow), July 29, 2015; see also, Paul Goble, "FSB Helps Islamists from Russia Go to Syria, Only Worried When They Come Back, 'Novaya Gazeta' Says," Window on Eurasia Blog, July 30, 2015. Eurasia Daily Monitor, The Jamestown Foundation, Washington, D.C., Jan. 7, 2016. The New York Times, Nov. 20, 2015. Bloomberg News Service (New York), Aug. 21, 2012; The Guardian (London), Feb. 8, 2013; Haaretz (Tel Aviv), May 4, 2013; Los Angeles Times, May 16, 2013. ABC News, Aug. 22, Sept. 6, 2013. The Washington Free Beacon, Aug. 27, 2013. The Guardian, Sept. 12, 2013. ABC News, Aug. 27, 2013. Lithuania Tribune (online), Aug. 29, 2013, accessed Jan. 25, 2016. Ukraine Today TV (Kiev), Dec. 20, 2015. The Guardian, Mar. 9, 2015. Pravoslavie (Moscow), Dec. 5, 2014. The Washington Post, July 16, 2014. Radio Free Europe/Radio Liberty, Oct. 14, 2015. The Wall Street Journal, Oct. 25, 2015; Bloomberg News, Sept. 13, 2015. Headlines & Global News (New York), Oct. 25, 2014; The Wall Street Journal, Oct. 23, 2015. Russia beyond the Headlines (Moscow), Sept. 9, 2015; Freeworld and Friends World, Sept. 16, 2015. The Washington Post, Sept. 24, 2015. Anatoly Dobrynin, In Confidence, Moscow's Ambassador to America's Six Cold War Presidents, 1962-1986 (New York: Time Books, 1995), p. 301. Defense News (Springfield, Va.), Dec. 1, 2015. The Washington Post, Sept. 30, 2015; The Telegraph (London), Sept. 30, 2015. YNet News (Tel Aviv), Jan. 15, 2016. Andrey Kortunov, "The Russian-Turkish Crisis: a Deficit of Strategic Depth," Russian International Affairs Council, Jan. 4, 2016. Related Topics: Russia/Soviet Union, Syria | Jiri Valenta | Leni Friedman Valenta | Spring 2016 MEQ receive the latest by email: subscribe to the free mef mailing list This text may be reposted or forwarded so long as it is presented as an integral whole with complete and accurate information provided about its author, date, place of publication, and original URL.